The Dräger TI500 Globe-Trotter® Neonatal Transport System combines all the technology of the Dräger TI500 Transport System with additional features for an improved level of care during transport. 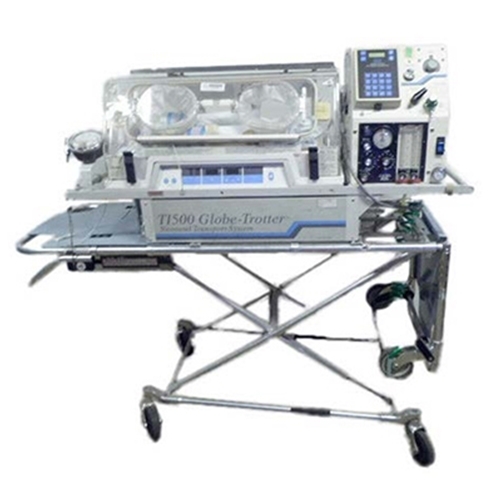 The Dräger TI500 Globe-Trotter Neonatal Transport System is designed to transport infants in a thermal neutral environment and also provides integrated ventilatory support. Your system can be configured with ventilation and oxygen analyzers to meet the specific needs of each patient. An auxiliary flowmeter is standard on the system, with an additional hand circuit to allow manual resuscitation if necessary. 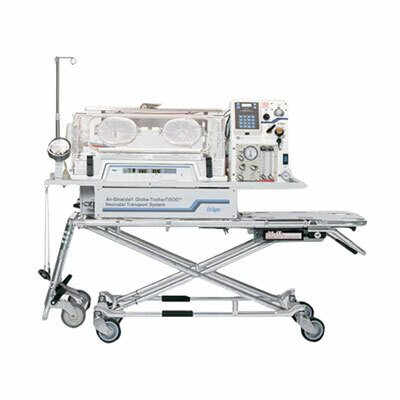 This enables you to ventilate twins in one incubator. 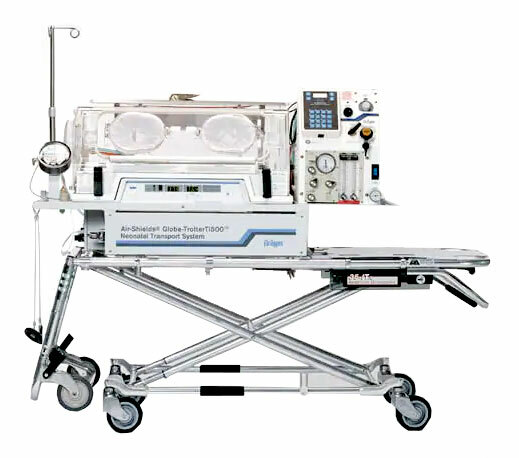 Of all the leading neonatal transport systems, the TI500 Globe-Trotter is the only one that has the option of an integrated air compressor. This allows you to deliver medical-grade air while eliminating the need to carry air tanks. 2 Quiet Touch Port Doors and 2 Access Doors. Range: 21% to 58% min. On/Standby: illuminates when “ON”. Power Mode: illuminates AC, DC, or external DC. Baby Temperature: displays infant temperature. Set Temperature: illuminates when changing set temperature. Alarm indicators: high temp, power fail, sensor fault, heater temp., air flow, low DC. Type: replaceable, 12 VDC, 24 AH gel-type battery. Rating: incubator maintains a differential of 25°C (77°F) between ambient and setpoint for 90 minutes on 1 battery or 180 minutes on 2 batteries at full heater power. Life Expectancy: 200 complete charge/discharge cycles minimum. Charge time: 20 hours per battery from full discharge. Used mainly to keep a baby’s core temperature stable at 37 degrees Celsius. Baby is cared for through special access doors called arm ports.